Grand InterContinental Seoul's Lobby Lounge will be hosting a unique summer buffet until the end of August. Every Saturday and Sunday from 14:00 to 19:00 eat to your heart's content the freshest, sweetest and most delectable fruits anywhere. There's nearly a dozen selections including rock melon, pineapple & golden pineapple, peaches, pears, mangoes and golden plums. 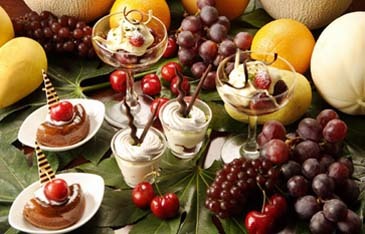 In addition to the sliced, whole, and dried fruits, there's also a memorable choice of fruit desserts such as fruit pates, compotes, and even caramelized raisin Foccoccia with assorted raw fruit dips — or for those who like it hot — Korean cherry buckle and baked apples with marzipan and walnuts, cinnamon Anglaise. The price of the buffet is 22,000 won (VAT and service charge not included.) (02) 559-7603.